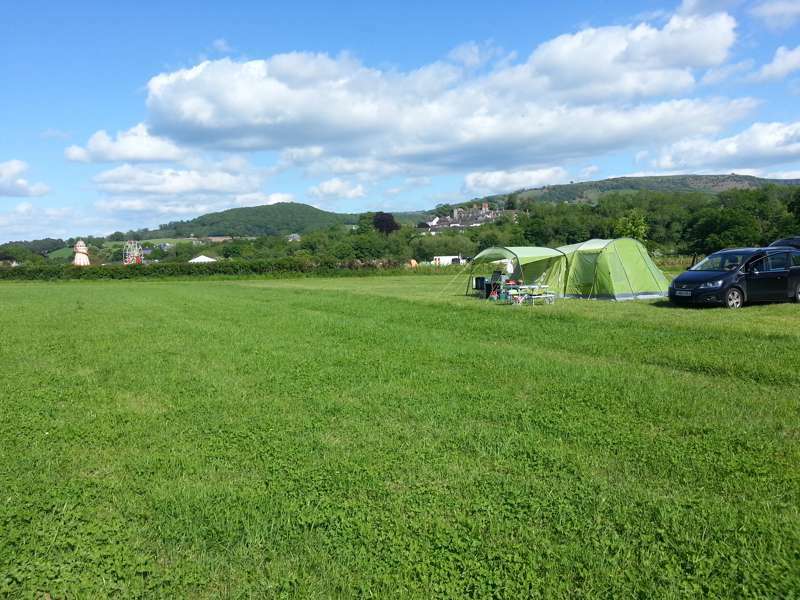 Bell tents 2 and 3 are near the bottom of the field, and enjoy stunning views of the mountains. They are set far enough apart so as not to disturb each other, but close enough for groups who wish to holiday together. 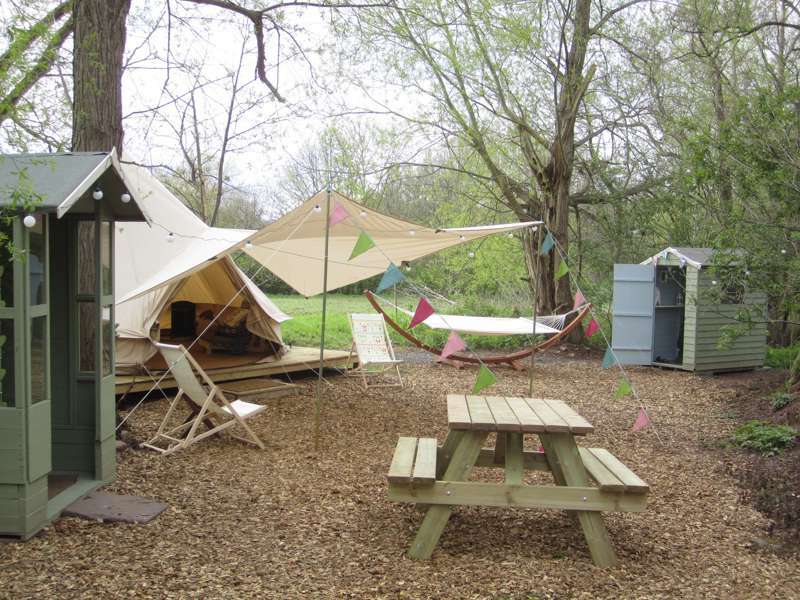 This bell tent can sleep up to 5 adults and 1 child (extra camping bed). 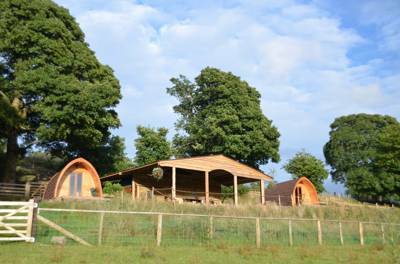 Tucked away on a lush, arable farm, with awe-inspiring views of the Black Mountains and Brecon Beacons, lies the eco-friendly Wye Glamping. The site's ethos is simple: relax and cosy up with Mother Nature in true comfort and style. Take a stroll through the rolling countryside, splash in the onsite stream, or simply settle down with a good book and take in the beautiful green expanse of your mountain surroundings. And isn’t that exactly how glamping should be? Guests have the choice of two accommodations. 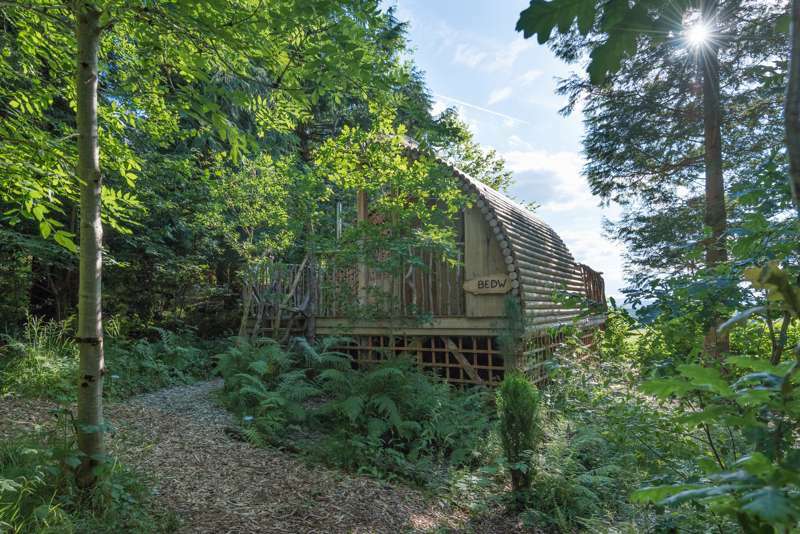 Firstly, tucked away along a hedgerow is the impressive 18ft yurt. Sitting slightly raised atop pristine decking, this fully furnished abode provides glorious, panoramic views of the field and beyond. 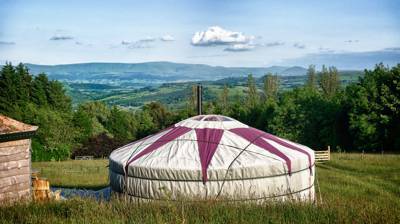 Given the lack of light pollution, the yurt is perfect for a spot of star gazing, and on a clear Brecon night the sky illuminates impressively. Lastly (but by no means least) are the site's four bell tents. Set alongside the nearby meandering river, each dwelling is located far enough apart to create a sense of seclusion, yet close enough for groups who wish to camp together. Facilities at Wye Glamping are ample to say the least. Both the yurt and bell tents have their very own adjacent kitchen hut which comes fully loaded with a gas stove, grill, pots, pans, cutlery, crockery and everything else you could possibly need. At the entrance of the ‘Glamping Field’, you'll find a luxurious wash room with a hot shower room and (drum roll please) a proper flushing loo. Each pitch also comes with a private compost loo – extremely handy for those midnight dashes! 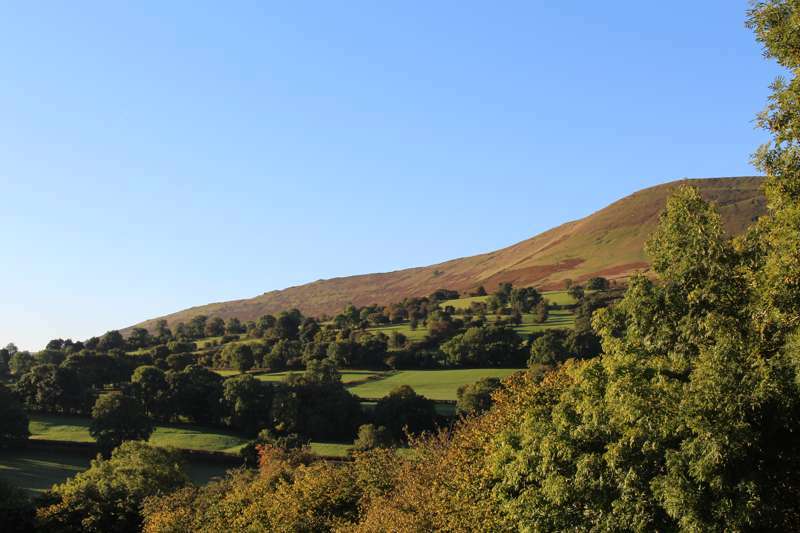 Wye Glamping couldn’t be better located to explore the gorgeous, undulating Brecon Beacons National Park. Waterfalls? Rolling fields? Charming towns? They’re all here. From the peaks of Cribyn mountain to the depths of its limestone caves, there’s plenty to see and do in this stunner of a national park. 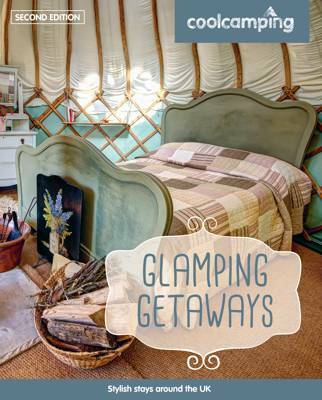 And being so close to all the action, Wye Glamping is the ideal base to go and explore it all. 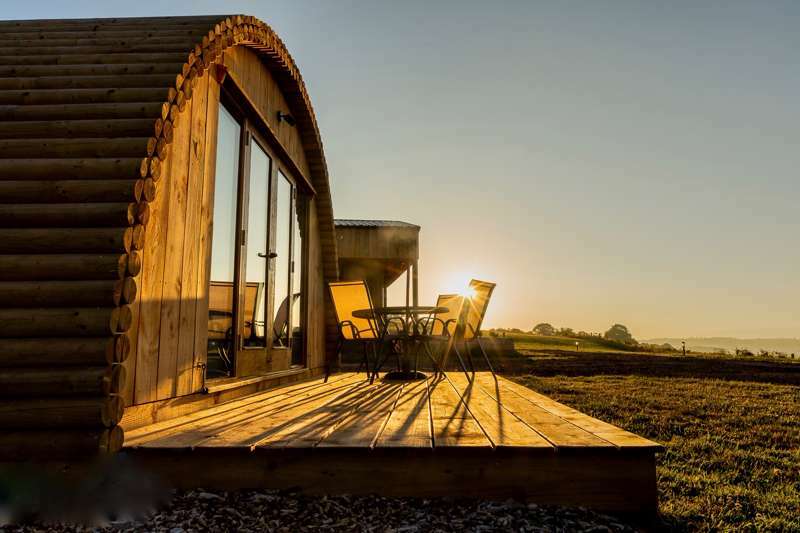 Tucked away on a lush, arable farm, with awe-inspiring views of the Black Mountains and Brecon Beacons, lies the eco-friendly Wye Glamping. The site's ethos is simple: relax and cosy up with Mother Nature in true comfort and style. 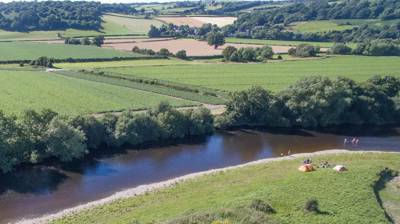 For latest availability and best prices for Wye Glamping, please use the Date Search above. 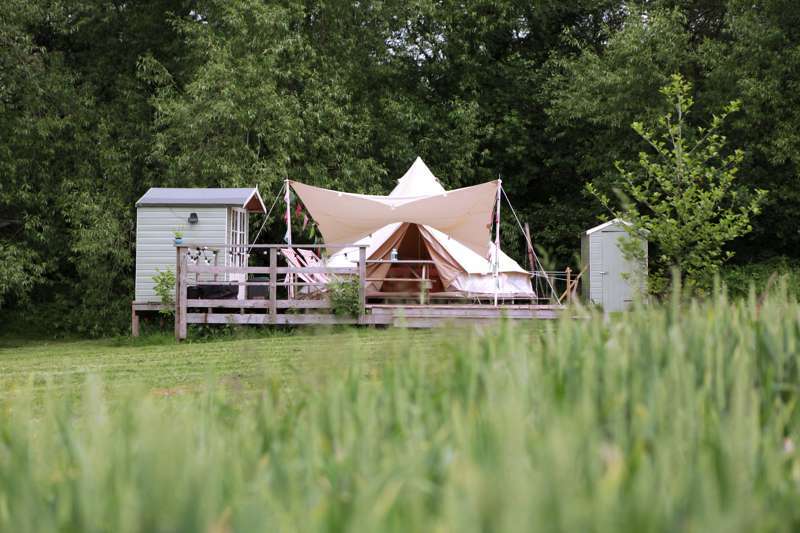 Wye Glamping offers the perfect combination of simple, rural bliss and a feeling of complete minimalism, while managing to supply everything you could possibly wish for! With only 4 tents on site and all overlooking a field of barley (Eva Cassidy rings in my ears as I type) this is a complete back to nature experience. A stream runs behind the tents, new born lambs frolic in the adjoining field, we sleep under canvas and introduce the kids to our private composting loo! And yet, a short walk away is a flushing loo and modern shower. The kitchen "shed" is a lovely touch - everything has been thought of. Even a whisk to enable me to whip up pancakes for breakfast. There's a generous supply of tea bags, coffee and enough milk, logs, kindling and charcoal to get us through the first 24 hours. The canopy over the deck meant that dinner wasn't disturbed when it started to rain. There are books and board games, loads of cushions and blankets and my biggest camping bug bear as I am getting on in years - lots of comfortable seating. From the futons in the bell tent, to the picnic bench on the deck, plus extra deck chairs and folding chairs. The bed was really comfortable too with a snuggly duvet and soft pillows. One major plus for us was that our dogs were more than welcome and loved the setting as much as we did. I always thought glamping was a bit of a cop out, but we spent the entire 3 days outdoors. This was real camping, but without all the stress and strain of putting up and taking down the tent and with the bonus of a very comfortable night's sleep. We enjoyed a trip to gorgeous Hay-on-Wye where there's a wonderful butcher, greengrocer and deli as well as lots of lovely cafes and a fancy ice-cream shop. We also took the children to nearby Llangorse for activities (climbing, high ropes and horse riding). 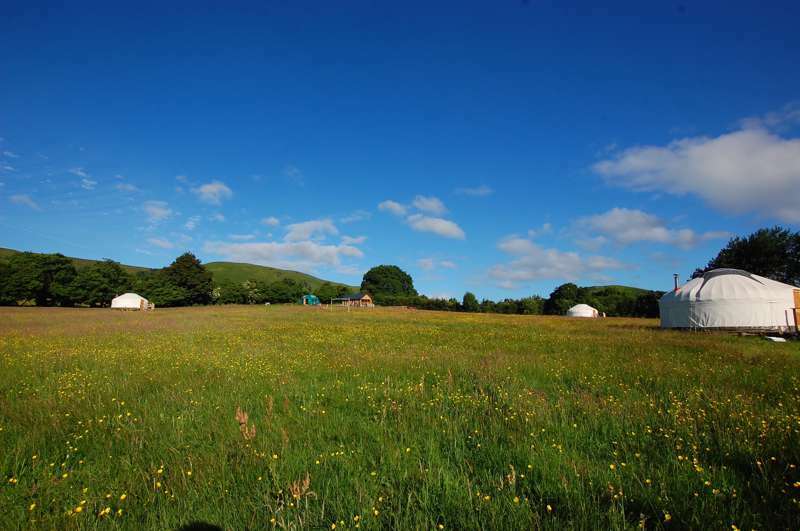 Glampers, children, couples, well-behaved groups, dogs (in bell tents 1 & 2) – yes. Tents, caravans, campervans – no. 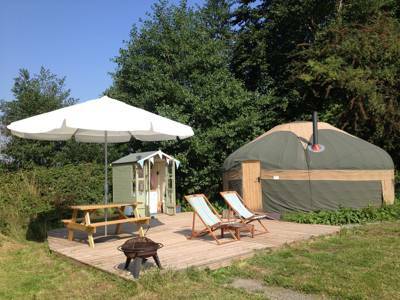 1 yurt, 4 bell tents (each on raised wooden decks) with gravel paths leading to each pitch. 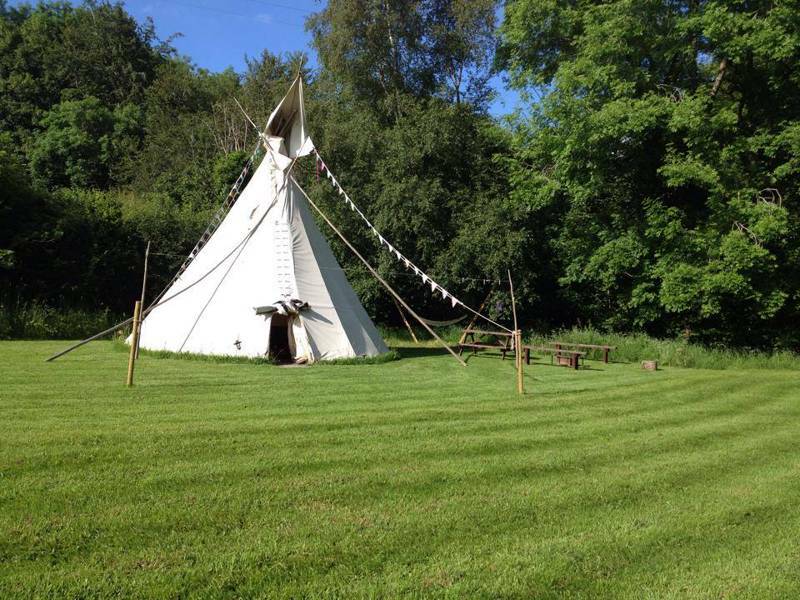 All accommodation comes fully furnished with a double bed, linen, reed matting on the floor, single futons (2 in bell tents, 3 in yurt) sleeping bags or own duvet required for these. Rugs, cushions, blankets and pillows provided. Shared luxury shower room (including 1 shower, basin and flushing loo), each pitch also has it’s own compost loo. Fully-equipped private kitchen with double burner grill, large cool box, cool packs, utensils, crockery and pots. Basics such as tea, toffee, sugar, milk, oil, salt, pepper, cling film and foil provided. Picnic bench, deck chairs, fire pit/BBQ at each pitch (1 bag of charcoal provided, more available on site for a small charge.) Wood burning stove in each abode (bag of logs, kindling, firelighters and matches provided, again more available on site), solar lighting, candle lanterns and a small selection of toys and games. There's a small river running alongside the pitches; waking up to the sound of river-bird song, or leaping fish is truly wonderful. The small market town of Hay-on-Wye (or Y Gelli Gandryll in Welsh) is often described as "the town of books”, and with good cause - there are tonnes of them! Books really are everywhere; the cinema's a book shop, the fire station's a book shop, the castle's a book shop, even the alleyways are book shops. And, if you plan your visit in May you'll catch the annual Hay Festival of Literature. Hay-on-Wye’s perfect position on the Wales/England border make the town ideal for visitors to explore the beautiful border country. The Welsh Crannog Centre (01874 658226) at Llangorse Lake is a recreation of a crannog: a house built on an artificial island on a lake, as used from pre-historic times all the way up to the Middle Ages. Crickhowell, a pleasingly old-fashioned small town in the Usk Valley with its (very) ruined castle, tea shops and spectacular bridge over the River Usk makes for a pleasant day out. Brecon is a lovely town to explore when the weather’s being unfriendly. Follow the Artbeat Trail around the cultural hotspots, crafty shops and galleries. Anyone fancying sports over shops and culture can head to Brecon Leisure Centre (01874 623677). The National Showcaves at Dan-yr-Ogof (01639 730284) are well worth a trip, too. Each accommodation has its very own kitchen facilities and there’s several independent deli’s, greengrocers, butchers and bakers in Hay-on-Wye to pick up some fresh local produce. The closest supermarket is 2 miles away. The charming Three Horseshoes (01497 847304) is a lovely country pub and conveniently located at the site's entrance. If the sun is out, sit outside and enjoy a pint with some hearty pub grub. There are several eateries in Hay-on-Wye. The best of these are The Blue Boar (01497 820884), Richard Booth’s Bookshop Café (01497 820322) and The Granary (01497 820790.) 12 miles down the road you'll find the recently opened Gurkha Corner Nepalese restaurant (01874610871), run by an ex-Gurkha soldier and his family. Alternatively, head to the Felin Fach Griffin (01874 620111), it’s pretty pricey but the food is sumptuous and they offer an à la carte menu – 3 courses for £27.50. There's also n Indian & Chinese takeaway/restaurants in Hay-on-Wye. Train to Hereford – bus to Hay-on-Wye – Taxi.